Should I Use A Full Spectrum or Isolate? Full Spectrum is referring to an extract which contains CBD in addition to other components from the hemp plant. This could be additional cannabinoids, terpenes and plant flavorings. The constituent makeup of a full spectrum product will vary depending on the manufacturer. Each company will have a different standard on what they consider to be full spectrum. Though some full spectrum products could contain a trace amount of THC (the psychoactive chemical in marijuana), this tiny amount cannot be felt. A product’s detailed scientific test results will reveal the ingredients. 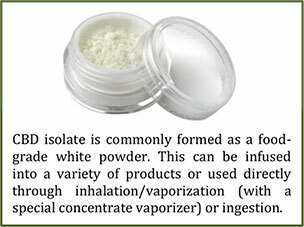 An isolate product uses a 99% pure CBD extract. In producing a CBD isolate, all other cannabinoids and terpenes are stripped away. Some manufacturers will combine a CBD Isolate with plant terpenes (or other essential oils) to recreate a full spectrum while ensuring the product has zero THC. Both a full spectrum and isolate will provide the analgesic and anti-anxiety benefits. Studies show that if you are looking for the anti-inflammatory properties of CBD, a full spectrum product will continue to give increasing benefits over time while an isolate could plateau at some point. What Strength Should I Get? CBD concentration preference will vary depending on an individual’s needs and physiology. In general, most people will start with a low/medium concentration and slowly increase the amount until they achieve the desired results. Products are compared by looking at the volume and CBD concentration. For example, a 30 ml bottle with 250 mg CBD is the same strength as a 60 ml bottle with 500 mg CBD. 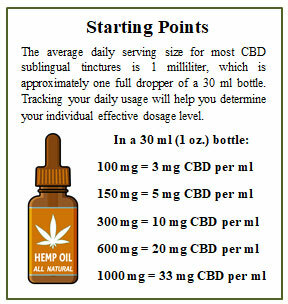 A 30 ml bottle with 1000 mg of CBD would be four times as strong.
. . . be patient. For most people and pets, regular use of a consistent amount will produce the most benefit. When using a natural herbal extract, keeping it in your body will maintain the plant’s potency over time. Because CBD is a natural herbal extract, consistent use is best. There is no standard schedule or “one size fits all” method of usage that guarantees the best results. Current scientific knowledge does not show any proven correlation between CBD concentration and a specific ailment. Each individual’s needs are different. Using CBD is a holistic method of self-care that promotes a healthy body and mind simultaneously. Some administration methods are faster than others and give more CBD per dose. Capsules will take the longest to become absorbed into the body (usually at least 20 to 30 minutes). Sublingual tinctures and oral sprays are faster. Inhalation (vaporization) is the fastest, but generally delivers less CBD per dose than other methods. There is no risk of overdose or addiction with CBD so using multiple types of products at once is perfectly safe. For example, using a capsule or tincture in the morning and supplementing with a vaporizer or topical cream throughout the day. Will I Fail A Drug Screen? 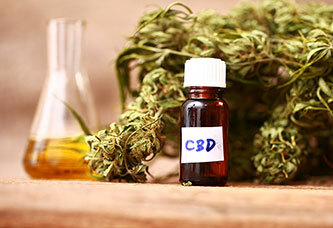 CBD is derived from hemp (Cannabis sativa). If your employment depends on passing a drug test we recommend not using any Cannabis-derived product. Employer drug tests vary widely in sensitivity and cutoff detection levels. It could be possible, though unlikely, to get a false-positive from a THC-free product. Trace amounts of THC can build up in your body, so over time it is possible to fail a drug test even though CBD products produce no psychoactivity and are not impairing in any way. Federal cutoff guidelines show a positive result for THC at 50 nanograms per milliliter in a sample, which is an extremely small amount. If drug testing is a concern, please check with your employer before using any CBD product. A THC-free product will stay that way even when consumed because CBD does not convert into THC in the human body. A 2017 study by the European Industrial Hemp Association found “there is no reason to avoid oral use of CBD, which has been demonstrated to be a safe means of administration of CBD, even at very high doses.” A 2018 in vivo animal study demonstrated no mechanism or evidence for the conversion of CBD to THC and suggested such conversion only occurs in fabricated laboratory conditions.